The conventional stop angles are made of aluminum, while the large stop angles (also available with integrated X-Pro rail) are made out of aluminum and Eloxal (anodized aluminum), what provides excellent protection against welding spatters as it can easily be cleaned of dirt and ensures a quick operational readiness with consistent accuracy for further projects. We opted for this production because especially around these big stops and angles, much welding occurs and therefore many splatter arise, which are also effecting the surface of the used tools and can interfere with the handling over time. Our universal angle scores with 4 functions: 1 and 2, the universal angle can be used as a left AND right angle, depending on which side you work. The angle is perpendicular to the table top and thus forms a 90° angle vertically upwards. Unlike the competition, where you have to buy a left and a right angle, our universal angle can be used on both sides. Padding on both sides is possible by simply turning the angle, as the leg length is the same for Forster Universal angles. Funktion 3: Lying flat on the table, you can move the angle infinitely and can thus everywhere on the table surface to produce a right angle as so-called interior angle. Function 4: For multiple X-profiles that are to be connected together, the angle can be used as a so-called stiff corner. You can tinker with such an auxiliary construction in order to weld 3-dimensionally. The X-profile is attached to the bracket attached to the tabletop, and then you can attach different attachments to the X-profile to build 3-dimensional without unduly obstructing access. The welder can work easier and faster because it’s a more ergonomic working method than using the old fashioned side panels on competitor’s tables. Metal frames that are to be welded at right angles to each other can be precisely clamped in the correct position with our stops and angles, without great effort and with only a few parts, what is very cost-saving. 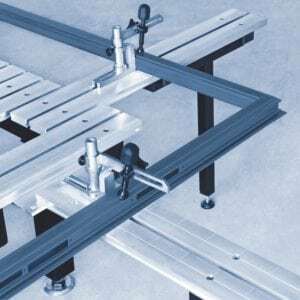 Our stop brackets with X-Pro double slot rail allow a 3-dimensional positioning to fix 2 components vertically in the room and at right angles to the table surface, ie on 2 axes. Compared to our competitors, they would use a 4-sided angle, or so-called tension tower, to attach the components and tension elements to it. However, these clamps are cost-intensive and, compared to our X-pro double slot rail, are not suitable for mounting a component as we do. Tension towers also take much more space on the welding table and therefore leave less space to weld. The angle of our competitors also has only 2 functional surfaces, a front and a side, depending on whether it is a right or a left angle. Our X-pro double slot profile, however, has 4 functional surfaces and is therefore quite differently suitable for correctly fitting the components and gives the welder much more features with the same investment.